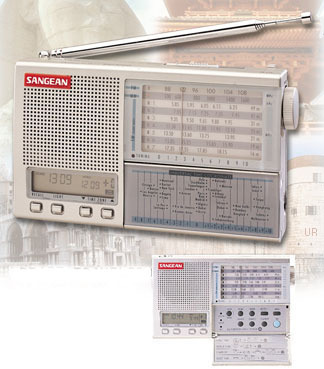 The Sangean PT633 ProTravel is a compact analog radio featuring AM, FM and nine shortwave bands. It makes a great travelling companion featuring a built-in dual time zone 12/24 hour digital clock. The LCD clock is back lit and has a DST (Daylight Savings Time) switch. 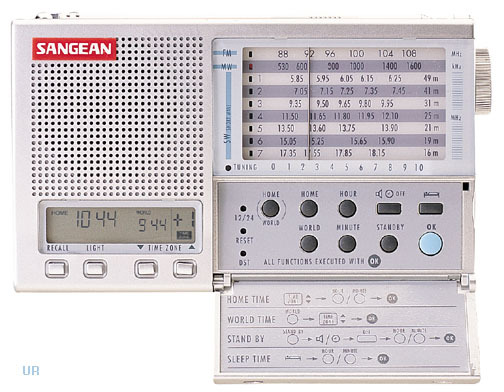 You can wake to radio or buzzer. Other features include: LED tune indicator, low battery indicator, stereo-mono switch and power lock button. Has jack for external 4.5 VDC power adapter (not supplied). Requires three AA cells (not supplied). Includes protective carry case and stereo ear buds. 6 x 3.5 x 1.25 inches. Copyright 2003-2016 Universal Radio, Inc.